In August, our National Park Service is marking its one hundredth year of service, and boy, have they been busy. Since the NPS took over the nation's Civil War battle sites in the 1930s, they have been diligent stewards of what are some of our most iconic landscapes. Last year, the NPS ended its four-year observance of the 150th anniversary of the Civil War at innumerable notable sites; looming ahead now are the sesquicentennials of important events that followed the war but--perhaps not surprisingly--there are no sites or monuments or parks that memorialize that pivotal period of our nation's history. The NPS commissioned a handbook on Reconstruction that will be available at the end of this Black History month. And, over the past year, the NPS has been conducting an ambitious National Historic Landmark theme study to identify nationally important sites dealing with the Reconstruction era; the results should be made public in the spring. Wonder what will make the cut? The NPS has played a major role in shaping popular historical awareness, and reshaping it when called for, especially concerning topics that many people tend to steer away from. Until the 1990s, Civil War battle sites offered only information pertaining to the battles themselves--the whos and whats, but not, emphatically, the whys. "Why and how these two armies got to that battlefield is irrelevant at the point of the battle," one person complained. The Department of the Interior disagreed in 2000 when it appropriated funding "to encourage Civil War battle sites to recognize and include in all of their public displays and multimedia educational presentations the unique role that the institution of slavery played in causing the Civil War." Information at National Sites has been revised and publications created in order to foster richer and more sophisticated conversations about the Civil War. Around the same time, a bill was proposed allocating preliminary financing to create a park service site dedicated to Reconstruction. So what happened? Historically, the Reconstruction period following the Civil War has been viewed as a disaster by most people. But scholars over the last fifty years have diligently worked to set the record straight: it wasn't ALL bad--a lot of good came out of it, actually--and certainly should not be ignored. Unfortunately, there's a huge gap between what historians know and public perception of Reconstruction. It is complicated, of course, but it was a time in this nation's history that generated change on an unprecedented level. After the Thirteenth Amendment ended slavery, the Fourteenth Amendment established national citizenship and promised individuals equal protection and due process of law. The Fifteenth Amendment attempted to outlaw racial discrimination in the right to vote (women would have to wait a while on that one). Public schools were created; hospitals, colleges, churches, and benevolent societies. At the same time, it was also a period of disappointment and disillusionment. 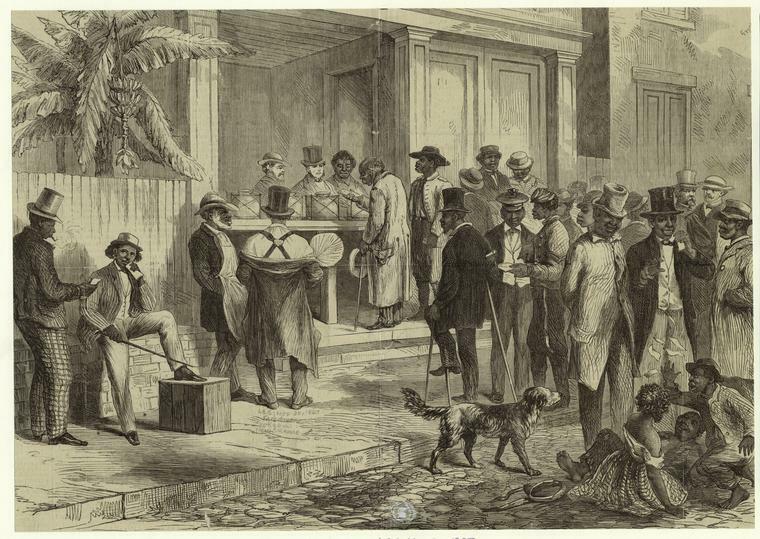 There was backlash from the progress, and ultimately by the turn of the century, many (but not all) of Reconstruction's gains were in retreat as "Jim Crow" laws went into effect. You can see how it's impossible to get from the Civil War to Civil Rights without going through Reconstruction. And if you're thinking that the Lowcountry played a pretty important role in Reconstruction, you'd be right on the money. If there's a logical place to tell an uplifting story about Reconstruction, few in the know would argue against the area around Beaufort, just down the road. Since Union forces took control of the area early in the war (November, 1861), it has been referred to as the "rehearsal for Reconstruction." On the sea island plantations whose owners had fled, soldiers worked with missionaries, teachers, and former slaves to create a workable society. The town of Mitchelville, founded on Hilton Head in 1862, was the home of about 3,500 freed slaves who built houses, worked for wages, established mandatory education and elected a local government. The Penn School on nearby St. Helena Island was one of the first schools established by missionaries in the South to teach former slaves. Robert Smalls, a slave who sailed a Confederate vessel out of Charleston to join the Union, ended up buying his former master's house in Beaufort and won election to the state legislature and to Congress. Sixteen years ago, this "Reconstruction hub" in Beaufort and surrounding areas got financing passed by the Senate but died in the House after changes in government administration. Lots has changed in the last sixteen years, so perhaps the time is right this go round. Who knows how many places the NPS will recommend for inclusion in the history of Reconstruction? Certainly the Greater Charleston area should be considered as there are a number of communities in the area that were built by former slaves during Reconstruction. There's Snowden in Mt. Pleasant, Liberty Hill in North Charleston, Maryville in West Ashley, Lincolnville near Summerville, as well as several communities on James Island. Not only was James Island farmed heavily by freed slaves after the war, it was also the site of the area Freedmen's Bureau on McLeod Plantation. The plantation is now operated by the Charleston County Parks and Recreation Commission as a museum and recently opened to the public. We wouldn't be surprised at all to see this property recognized as an important Reconstruction era site. Have y'all been yet? Who Remembers the Old Charleston Museum?